My usual go to protein powder for breakfast smoothies is Sun Warrior Protein Powder, it’s smooth, sweetish and has a nice, mild chocolate or vanilla flavor pairing perfectly with fruit and overpowering all the veggies I cram in. But sometimes I gotta change things up and try something new. I figured while my half-marathon training is really starting to kick into high gear, perfect timing to try a powder with a little extra “power”. I’ve been wanting to try Vega products for awhile now, but price has been stopping me. 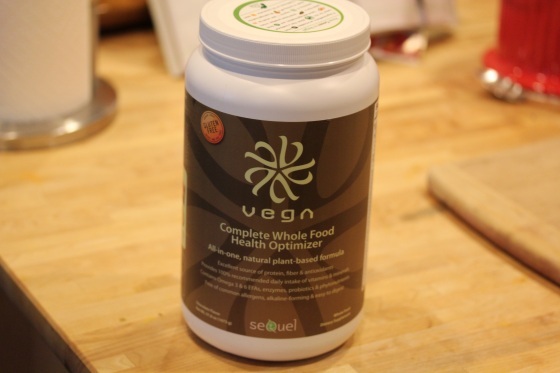 I gave in and selected Vega Complete Whole Food Health Optimizer in Chocolate because it’s a lot more than a protein powder designed to be a standalone meal when an entire serving is mixed with water or a partial serving can be added to smoothies for a nutrient boast. When I received the powder, I was a bit in shock that the $67 jug only had 15 servings! But a serving is 2 huge scoops packing 260 calories and a whole heap of vitamins. It says on the package that those with “smaller” appetites could only use one scoop which is what I’ll be adding to my smoothies and stretching this jug to 30 servings. Among the long list of nutrients the powder contains, I was comforted to know it’s a great source of vitamin b12 and calcium as well as packing 100% values of many other vitamins, it’s nice knowing I’m getting the added nutrients in the morning. I was looking forward to trying it in my smoothie this morning, using only 1 scoop with a frozen banana, spinach and a carrot. When I sampled the powder by itself, it reminded me a lot of Ovaltine, only a slightly grittier and less sweet version. 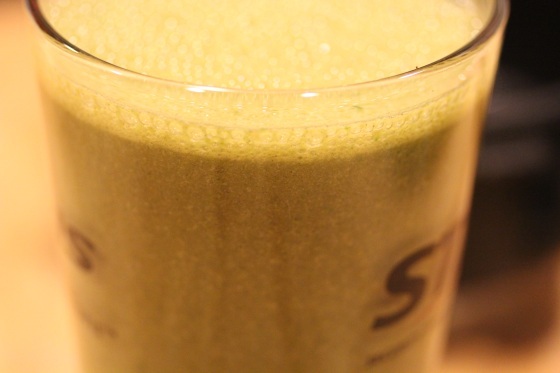 So I added a packet of stevia to my smoothie too. Sadly, I was not too impressed with the flavor, it’s grittier than the Sun Warrior powder, barely sweet with a very mild chocolate flavor and a slight bitterness. It wasn’t bad, definitely drinkable. But I wouldn’t call it a treat and not something I’d use in protein ice kream. However, it did go down well, no problems digesting and I think I actually felt slightly more energized at work this morning and it did hold me til lunch nicely. I’m not totally sure that’s worth the price or flavor, but I will keep working my way through this jug to see how I feel. I can say that this is something I couldn’t afford on a regular basis and would only buy for training and maybe emergency travel breakfasts. 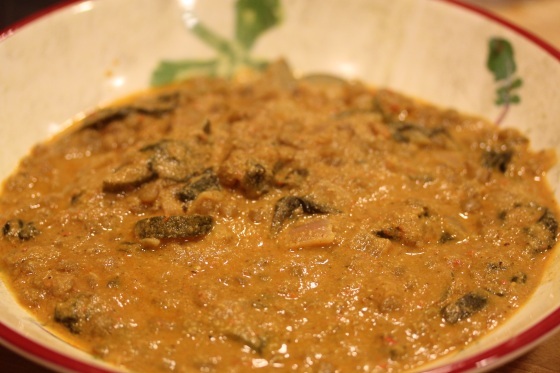 Or even great to have when sick or recovering from illness when the body might be nutritionally compromised. For lunch I met a friend at Tres Agaves, a unique Mexican restaurant with classier food, or entrees that aren’t paired with 14 lbs. of beans, rice and cheese. 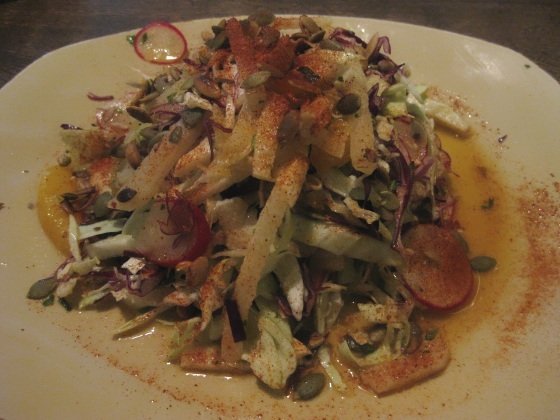 They have an amazing all raw or mostly raw vegan entree – a jicama salad with pumpkin seeds, oranges, cabbage and plenty of chili powder and citrus flair. And since it was a super busy day, I went with a comfort food dinner using my creamy tomato soup base with green lentils, chopped zucchini, red onion and spinach. Your lunch and dinner look fab! I love sun warrior—haven’t tried chocolate yet though. I definitely think vega comes in a distant second to sun warrior, but you’re right that is does have lots of additional stuff. The berry flavor of the whole food optimizer is better than chocolate! Good to know on the berry flavor, I was torn between that and chocolate when I ordered it. I tried the chocolate blended with frozen berries this morning and it was better. omg that mexican dish looks so good! I would of cleaned the plate too! Oh no margaritas?! lol! Yeah that would not be a good idea going back to work buzzed up! lol! Sun Warrior is awesome and I’ll be ordering another batch of it shortly to mix in with the Vega I think. I love the sun warrior vanilla, my got to. I’ve tried the Vega but didn’t like it so much and it is expensive as you say. I noticed the energy thing to with Vega, it actually gave me the jitters similar to caffeine which I avoid. 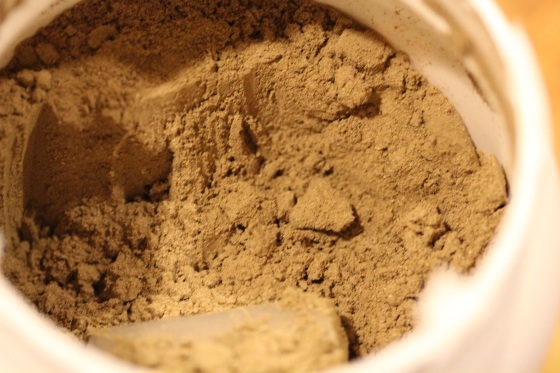 I discovered that it was the Maca, so I avoid anything with Maca in it now. The energy was good just didn’t like the jitters. I’m pretty sensitive so many may not find this. I was anxious to read your thoughts on Vega. The price steers me away, too. I did try a packet of vanilla chai and it was awful. Whatever they use to sweeten, I don’t like it! Haven’t bought anything since then. If I were to try Sun Warrior, what’s a good first flavor? Tough call on Sun Warrior, I like both vanilla and chocolate equally I think. Vanilla is more versatile in smoothies pairing with a wider variety of fruits and you can always add a little cacao powder to make it chocolaty, so I’d say vanilla. Oh my goodness- that salad looks incredible! 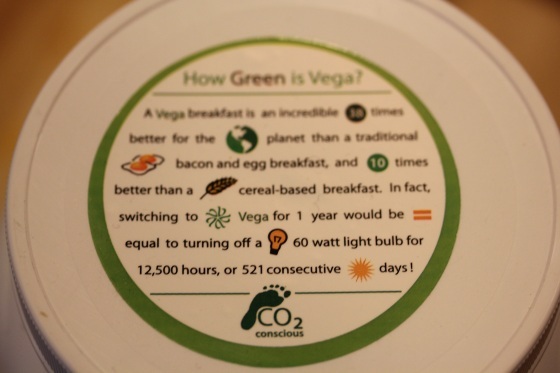 I love Vega products but they are pretty expensive… oh well, here’s to health! Happy Friday! Wow that salad looks amazing! I wanted to like Vega so badly but I find that one absolutely disgusting. The type of stevia they use is sooo bitter. 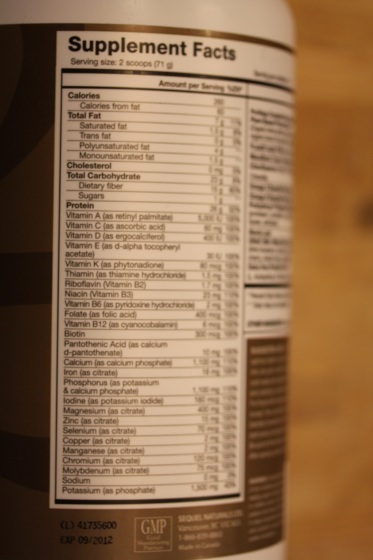 You may want to try the Vega shake and go smoothie protein powder in “choc-alot”. It uses palm sugar as the sweetener and is actually really good! (still expensive though). 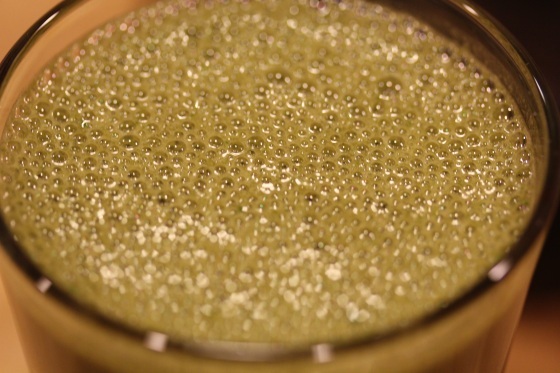 I’ve never tried Sunwarrior – every brown rice protein powder I’ve tried has a chalky taste to me. But everyone swears by sunwarrior.